In their opening monologue for this year’s Golden Globe Awards, hosts Tina Fey and Amy Poehler introduced Selma with a pointed joke: “The movie Selma is about the civil rights movement which totally worked and now everything is fine.” It was a good line. It got a big laugh. But it also perfectly captured why, in 2015, it is hard not to experience Ava DuVernay’s powerful, inspiring and triumphant film without feeling just a tinge of sadness. That sadness comes from the knowledge that half a century on from the Selma march, in a world of Trayvon Martin, Michael Brown and Ferguson, we still have so far to go. 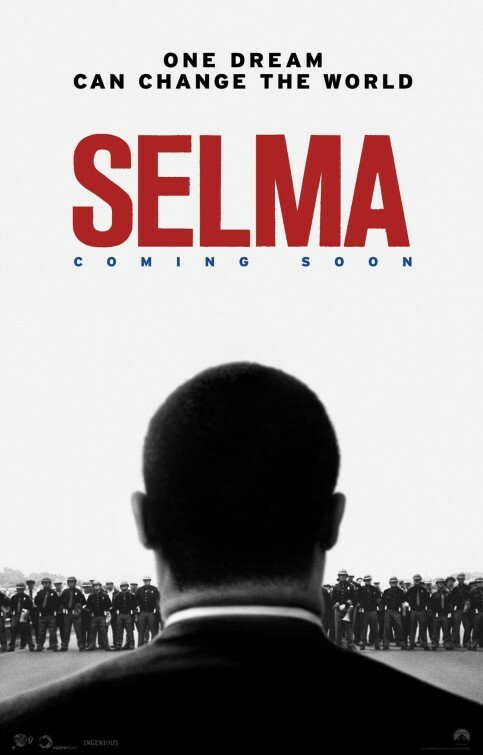 It may seem hard to believe, but Selma is the first time we have seen a theatrically released studio film with Martin Luther King Jr as its protagonist. But Selma is not a biopic as such. Great films will often focus on a specific story in order to illuminate a greater one. As such, DuVernay does not attempt to tell the entirety of Dr King’s story. We don’t see the Montgomery Bus Boycott, the Birmingham campaign or the “I have a dream” speech. Instead, the film focuses in on the 1965 campaign by King and the Southern Christian Leadership Conference to protest the disenfranchisement of black voters in Alabama. Selma was a town with a 50% African American population, but less than 2% of them were registered to vote. While blacks were legally entitled to vote, there were systematic barriers put in place to prevent them from exercising that right. The campaign would culminate in a five day march from Selma to the state capitol, Montgomery. It is one story that is reflective of the whole. Selma is not interested in deifying King. DuVernay treats him like a man. The film’s opening scene is a tender moment between King and his wife, Coretta, before he receives the 1964 Nobel Peace Prize. We watch him going over his speech and struggling with his tie, and it humanises him. As the film progresses we see the pressure and self-doubt that a man in his position inevitably felt. Similarly, the film does not sugarcoat his story. While not making it a major plot point, Selma touches on King’s infidelity. British actor David Oyelowo delivers an outstanding performance as the civil rights leader, both in the quiet, introspective moments and when King is in his element, in the public eye and in the pulpit. Oyelowo successfully captures King’s oratory style and cadence, and these orations retain their power despite the fact that DuVernay had to rewrite them due to the prohibitively expensive costs associated with using the actual texts, which the King family retain copyright on. As well as capturing the essence of the man, Selma succeeds in communicating the logic and effectiveness of his methods. The film is a powerful reminder to the present day of the importance of non-violence. It shows us the power of non-violence in the face of aggression. It reminds us of the futility of using violence to overcome injustice. It also gives us insight into the strategic mind of King, particularly his manipulation of the media. Part of the attractiveness of bringing the SCLC to Selma was its potential for theatrics, and in turn, media coverage. You have to position yourself to be heard. King tells his people only way to get the President’s attention is to be on the front page of every newspaper and on every nightly news bulletin, and to do that requires drama. When the first attempt at the march ended in a confrontation with Selma Police on Edmund Pettus Bridge, the video footage of what came to be known as ‘Bloody Sunday,’ showing white police beating unarmed and non-retaliatory black men and women, young and old, was beamed into households across the country and played a major role in garnering widespread support for the movement. DuVernay also de-mythologises the civil rights movement. Selma shows them to be a highly dedicated but divided and combustible collection of people who share similar goals but believe in different approaches. Upon their arrival in Selma, King and his SCLC companions are confronted by members of SNCC, the Student Nonviolent Coordinating Committee. These young men believe in a less confrontational approach than the SCLC and have already been working at a grass roots level for change in Selma. Likewise we see Malcolm X, who appears as a peripheral character in one very interesting scene, but represents a more militant approach. 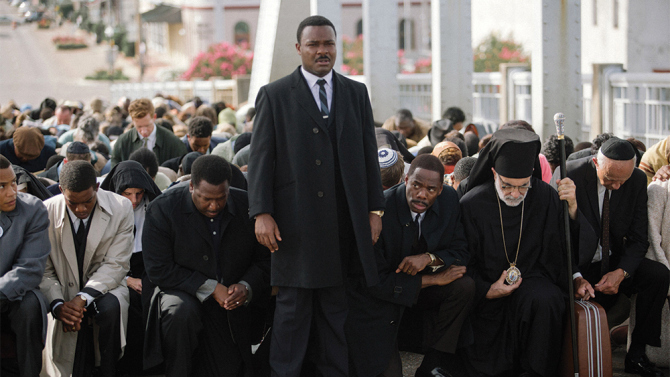 Selma is on a much larger, more epic scale, than any of DuVernay’s previous films. Yet while handling this larger canvas with seeming ease, she manages to retain the intimacy of a smaller film. She brings a humanity and honesty to her characters and an immediacy to the events which prevents the film from feeling like a history lesson. Being a black woman, DuVernay also brings a different gaze and perspective to the film as its director. As such, Selma brings us different characters. Not only do we have black characters with real agency, we also have active female characters and active elderly characters, three groups that usually lack agency in mainstream cinema. Much has been made of the supposed “snubbing” of this film by the Academy, with a number of high profile voices speaking out. No doubt Oyelowo and DuVernay would have looked right at home in their respective categories, but I’m also not convinced that there is anyone in those fields who doesn’t deserve to be there. Regardless, the ultimate importance of this film and the reason that it will endure as a document will have little to do with awards and statues. Selma is more than that. Have you seen Selma? Leave a comment and let us know what you thought?